Home made dog biscuits can be quick and easy to make, especially with the availability of dog biscuit mixes on the market. The guesswork is taken away and you don't have to be concerned about proper nutrients or preservatives because those determinations are already made for you in the products. There are numerous recipes for making the biscuit dough from scratch, if that's the way you prefer to go. We prefer quick and easy, so we tout the homemade mixes which come in a variety of flavors. 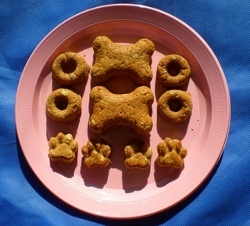 This picture shows off the various types of pans used for the dog biscuits: doughnut shaped biscuits on the sides, muffin dog bone shaped biscuits in the middle of the plate, and mini-paw-print dog biscuits on the bottom. These dog biscuits were made with a silicone biscuit mold like the paw print cake pans, a small doughnut baking pan, or a bone-shaped muffin pan and press the biscuit dough inside. The biscuits will bake nicely into those shapes. The biscuits are now ready for decorating. Mix up some dog treat icing in various colors and sprinkle with colored coconut pieces or colored sesame seeds and you will have a beautiful array of dog treats worthy of any dog's appetite. Choose any cookie cutters you like or opt for the dog bone shaped cutters. If you look around this site, you will see various shapes that came from cookie cutters. For example, fourth of july cookies for dogs are simply made from a homemade dog biscuits recipe. The stars and the flag were cut out from the dough and then decorated with dog treat icing. Another example: football theme dog treats as shown. Again, we cut out the football shapes and they became "footballs" through the dog treat icing.